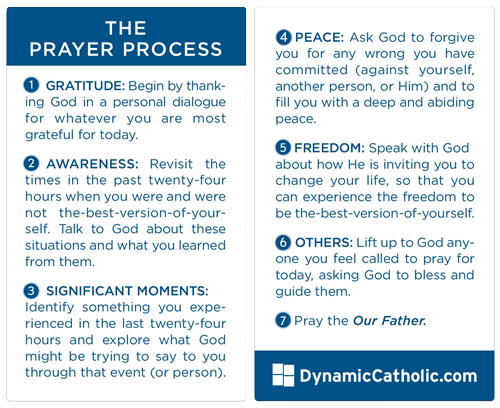 Begin by thanking God in a personal dialogue for whatever you are most grateful for today. Revisit the times in the past twenty-four hours when you were and were not the-best-version-of-your-self. Talk to God about these situations and what you learned from them. Identify something you experienced in the last twenty-four hours and explore what God might be trying to say to you through that event (or person). Ask God to forgive you for any wrong you have committed (against yourself, another person, or Him) and to fill you with a deep and abiding peace. Speak with God about how He is inviting you to change your life, so that you can experience the freedom to be the-best-version-of-yourself. Lift up to God anyone you feel called to pray for today, asking God to bless and guide them.